A hydrocolloid can simply be defined as a substance that forms a gel in contact with water. Such substances include both polysaccharides and proteins which are capable of one or more of the following: thickening and gelling aqueous solutions, stabilizing foams, emulsions and dispersions and preventing crystallization in frozen products. In the recent years there has been a tremendous interest in molecular gastronomy, molecular cooking and modernist cuisine. Part of this interest has been directed towards the “new” hydrocolloids. The term “new” includes hydrocolloids such as gellan and xanthan which are a result of relatively recent research, but also hydrocolloids such as agar which has been unknown in western cooking, but used in Asia for decades. One fortunate consequence of the increased interest in molecular gastronomy and hydrocolloids is that hydrocolloids that were previously only available to the food industry have become available in small quantities at a reasonable price. A less fortunate consequence however is that many have come to regard molecular gastronomy as synonymous with the use of hydrocolloids to prepare foams and spheres. I should therefore emphasize that molecular gastronomy is not limited to the use of hydrocolloids and that it is not the intention of this collection of recipes to define molecular gastronomy. Along with the increased interest in hydrocolloids for texture modification there is a growing skepticism to using “chemicals” in the kitchen. Many have come to view hydrocolloids as unnatural and even unhealthy ingredients. It should therefore be stressed that the hydrocolloids described in this collection are all of biological origin. All have been purified, some have been processed, but nevertheless the raw material used is of either marine, plant, animal or microbial origin. Furthermore hydrocolloids can contribute significantly to the public health as they allow the reduction of fat and/or sugar content without losing the desired mouth feel. The hydrocolloids themselves have a low calorific value and are generally used at very low concentrations. It is indeed surprising that the health benefits of hydrocolloids receive so little attention. One major challenge (at least for an amateur cook) is to find recipes and directions to utilize the “new” hydrocolloids. When purchasing hydrocolloids, typically only a few recipes are included. Personally I like to browse several recipes to get an idea of the different possibilities when cooking. Therefore I have collected a number of recipes which utilize hydrocolloids ranging from agar to xanthan. In addition to these some recipes with lecithin (not technically a hydrocolloid) have been included. Recipes for foams and gels that do not call for addition of hydrocolloids have also been included for completeness. Some cornstarch recipes have been included to illustrate its properties at different concentrations. However, recipes with other starches have been omitted. Similarly, recipes where flour is the only thickener do not fall within the scope of this collection as these are sufficiently covered by other cook books. All recipes have been changed to metric units which are the ones preferred by the scientific community (and hopefully soon by the cooks as well). In doing so there is always uncertainty related to the conversion of volume to weight, especially powders. To give an example: the amount of flour in a cup depends on whether the flour is sifted, spooned or scooped into the cup. Conversions up until v. 2.3 were done at http://www.convert-me.com/en/convert/cooking. Starting with v.3.0 all new recipes have been converted from US customary volumetric units with mye volume-to-weight Excel spreadsheet calculator. Hydrocolloid densities are found in the appendix. As far as possible, brand names have been replaced by generic names. Almost all recipes have been edited and some have been shortened significantly. To allow easy comparison of recipes the amount of hydrocolloid used is also shown as mass percentages and the recipes are ranked in an ascending order within each chapter. When collecting and editing the recipes, obvious mistakes have been corrected. But unfortunately the recipes have not been tested, so there is no guarantee that they actually work as intended and that the directions are complete, accurate and correct. An exception to this are all the recipes which now feature pictures. One motivation for including pictures of the actual recipes was that these may serve as a “proof” that the recipe actually works. Furthermore, in the cases where the source of a recipe is a specific website, this may also be taken as a good indication that the recipes in fact has been tested and works. It appears as if some of the recipes are not optimized with regard to proper dispersion and hydration of the hydrocolloids which again will influence the amount of hydrocolloid used. It is therefore advisable to always consult other similar recipes or the table with the hydrocolloid properties. The recipes have been collected from various printed and electronic sources and every attempt has been made to give the source of the recipes. But there is no guarantee that the source given is the original source of the recipe. Given the many recent books about molecular gastronomy and modernist cuisine I have certainly asked myself: Is there a need for a revision of Texture? Since you read this I obviously landed on a “yes”. As a toolbox for chefs and amateur cooks I still believe that this collection is unique for several reasons: the ranking of recipes according to the amount of hydrocolloid used, the texture index and the total number of recipes. To the best of my knowledge no other cook books have taken the same approach to collect and systemize recipes this way. 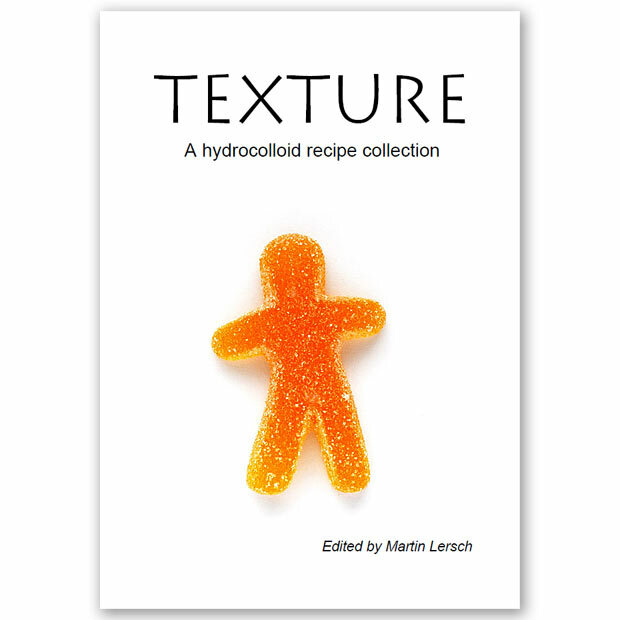 And judging by the feedback I have received many chefs and food enthusiasts around the world have found Texture to be a useful resource in the kitchen (to which the 80.000 downloads from Khymos alone also testify). I do not regard Texture as a competitor to the numerous books available, but rather as a supplement. Inspiration for cooking is best sought elsewhere, but if Texture can inspire to experimentation with the texture of foods I believe it has fulfilled its mission. Since recipes can neither be patented nor copyrighted, every reader should feel free to download, print, use, modify, and further develop the recipes contained in this compilation. Texture is published under a Creative Commons Attribution-Noncommercial-Share Alike license. As long as you include an attribution, don’t charge any money for it and share it under the same conditions – you are more or less free to do whatever you like with the collection (see more details on p. 2 in Texture). The latest version will be available for download from https://blog.khymos.org/recipe-collection and updates will be announced on Khymos (https://blog.khymos.org) and on twitter (@tastymolecules). Lastly I would like to thank readers for giving me feedback and suggestions on how to improve the collection. Feedback, comments, corrections and new recipes are always welcome at webmaster@khymos.org or by using the contact form. Nice set of recipes. Surprised not to see potato starch in there, given that corn starch was. Potato starch is quite popular in Russian cooking and has a lot less flavor than corn starch. Kissel could be a reference item. Curious if Gellan Gum can be used as a replacement to Xanthan Gum in a gluten-free flour mixture. If so, any info on ratio? Gluten-free flour is composed out of multiple wheats. It depends on the mixture i guess. I see: rice, buckwheat, potato, corn and more being used in gluten-free flour. I am a french student, then excuse me for my english speaking. I have to do a schoolwork and I would like to know more about this article. Is it possible to sent me the frozen florida recipe and a photo ? Could you send me this article ? It would be great if you could help me. However it’s quite important for me. Thank you so much for this amazing collection! This is info I have been seeking for ages, all in one place, so exciting and so generous! Blessings! Many thanks for your wonderful contribution to the health and happiness of humanity. Noticing a typo, I guess you’d call it, for your soft-set orange marmalade on page 76. The directions are seemingly copied and pasted from the recipe just below it for traditional raspberry jam. Help on the marmalade? Thanks. Thank you for creating this book and making it available to us non-chefs. It answers all the questions that I had concerning non-gelatin gelling and then goes on to answer thousands more question that I didn’t know I should ask. I am trying to make a golden beetroot jelly but when I heat the liquid to dissolve the gelatin, it turns brown. I’ve tried avoiding this by adding lemon juice, but it doesn’t seem to make any difference. All of the gelling agents that I have looked at seem to require high temperatures. Am I missing something? Thanks for your articles and elaborate explanation concerning food recipes. Am a food Techonologist majoring in gums products. Could you please assist me in explaining why I do have problems with my gum recipes as far texture of bubbles gums especially gum base. Some gum base gives soggyness, melting feeling in the mouth or even gums hardening and breaking with no elasitisity. Thanks in advance.